As I posted here, there have been some tornado situations of late where people have received bad advice from public and private sources regarding what to do as a tornado approaches an urban area: that is, they have been told that if they don't have a purpose-built tornado shelter, they won't survive and should attempt to escape the tornado by driving away in their vehicles. In the essay linked above, I give the reasons why this is a bad idea. 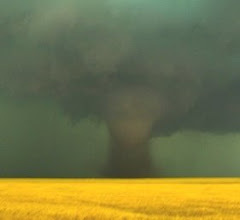 The notion of attempting to escape owes its existence at least in part to the now-infamous words spoken by Gary England (former weathercaster at KWTV in Oklahoma City), paraphrased as "You won't survive this tornado above ground!" I've shown in the essay linked above that this statement, often repeated, is simply wrong, even in homes hit by EF4-5 winds in an EF4-5 tornado. In such a tornado, the most violent winds affect only about 10% of the total damage path. Put another way, 90% of the damage path experiences winds of EF3 or less, which means interior walls of a well-built frame home will remain standing - such is very survivable if the occupants take the recommended safety precautions (sheltering in bathrooms, under staircases, interior rooms with as many walls between you and the tornado as possible, away from windows, etc.). What about the small fraction of homes hit by EF4-5 winds where the home is completely swept away? Even in such unlucky circumstances, the observed fatality rate is about 1%!! You may be injured, perhaps even seriously, but the odds of survival are overwhelmingly in your favor if you "shelter in place". Motor vehicles can be death traps in a violent tornado. And it's difficult to tell tornado intensity by its appearance, so you should treat all approaching tornadoes as if they could be violent - because they can be. Recently, the National Weather Service's Central Region began an 'experiment' with Impact-Based Warnings. I discussed my concerns about this experiment here. One piece of fallout from this misguided experiment being perpetrated on the public is that some offices are advising the recipients of their official warnings to drive away from tornadoes. Some private sector meteorologists are saying it's inappropriate to criticize them for doing what the NWS (or at least some offices) is doing: telling people to flee tornadoes in their vehicles. The problem with this viewpoint is that what the NWS chooses to do (or not do, as the case may be) is no excuse for a broadcaster to give out misinformation. Two wrongs do not make a right. Note: In rural areas, it's quite possible to escape tornadoes by driving out of the path, assuming you know how to recognize which way the tornado is moving. Also, if your home lacks adequate shelter and you're concerned about your safety, if you choose to leave for some other already-selected location where you have appropriate shelter, you should do so long before (i.e., hours) a tornado is sighted heading your way. Normal traffic conditions will prevail in such cases and you'll not be put in danger by waiting until a tornado actually develops and your home is in the path. It's possible for anyone to make a mistake - giving advice for people to drive away from the El Reno and Moore tornadoes of 2013 is a big mistake. Those broadcasting that advice need to undertand that it was a mistake, admit they made the error, and not repeat it. There may be TV station lawyers and management who are fearful of their broadcaster's admitting to an error - for fear of litigation. It's a very sad commentary on those lawyers and managers, if so. Public safety should be the primary consideration in any hazardous weather event - not ratings and not the fear of litigation. If those responsible for dispensing bad information don't willingly come forward with an admission of error and at least an apology, then it seems nothing prevents them from repeating the misinformation over and over in the future. Doing so is a disaster waiting to happen, and it eventually will happen. It's proven very difficult to get people to quit using highway overpasses as impromptu tornado 'shelters' despite a vigorous campaign to do so. For reasons I can't imagine, people continue to endanger themselves (and others!) by using overpasses as tornado shelters. Are we going to see similar persistent poor responses by the public, putting themselves and others at risk by attempting to escape tornadoes in urban areas by fleeing in their vehicles? Only time will tell, but in the meantime, we all need to be on the 'same page' in sending out the message that this is a bad idea! I have never been a fan of dispersing information which gives anyone, any kind of option to flee in their vehicle. I haven’t liked some of the NWS information that I have seen which somewhat explains, certain kind of situations, maybe if you have to, probably shouldn’t, but if you do – kind of wording. When people ask me what to do if a tornado approaches, the only time I suggest using a vehicle to get to nearby shelter is if they are fleeing a mobile home. Any house, or business, regardless of construction should be used for shelter before taking it to the road. I don’t have to go over the statistics you have already mentioned concerning how survivable even violent tornadoes are. IMO, there are too many – way too many considerations that are required for a person to make the decision of fleeing in a vehicle. Many of these considerations involve unknowns, and matters that are out of someone’s control. Keeping instructions simple during times of emergency is extremely important. Don’t flee in your vehicle. Take recommended precautions for the building you are in. That advice has proven to work well, over and over again for many decades.